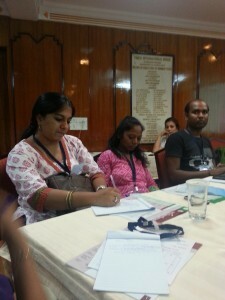 We (Lakshmi & Vasumathi) attended a Communication and Documentation Workshop organised by the Centre for Advancement of Philanthropy – CAP at YMCA, Mumbai on the 25th of July, 2013. As for all the CAP workshops, the seats were already full, when we decided to register. This did not come as a surprise at all, we only cursed ourselves for not being the “early enough birds” to register. But we were glad to receive a call from Martina just a few days before the workshop telling us that there was a room for two participants and we jumped at this proposition. (Next time we must remember to register the day we get the announcement). The CAP team describes us as their “Resident Workshop attendes” and right from the time the workshop started we were glad to be so. Mr Noshir Dadrawala started the session on “Writing Effective Proposals” by posing the “9 Questions To Consider While Preparing Case for Support?” This session made participants introspect on some core questions that should guide the way each person thinks and projects about his/her organisation. One of the interesting questions was “why are you proud of your organisation and why would a donor want to give to your org?”. We said , what QMed does is to make people realize that “they don’t know, what they don’t know” and our area of work in the healthcare domain is so niche and unique that we can proudly say that we are the only NGO in India doing the kind of work that we are in doing. In his inimitable style Mr Noshir kept the participants engaged adding subtle humor and wit as required. His efforts in making the participants think through their replies to refine their strategies to the maximum, made us look at QMed from a new perspective. The next session was on “Reporting to Donors” conducted by Ms Priya Agrawal. This session covered a range of reports (monthly, quarterly, annual) that NGOs could maintain to document their work. Ms Priya helped us understand the the nuances of maintaining reports and the need and place that each report has in documenting the work that we do. The final session for the day was by Ms Benita on “Website Design and Social Media”. Her session on website design helped us look at our recently re-designed website in a better manner and we also gave ourselves a small pat on our backs to have got most of the things right with the website design. Ms Benita used some great examples to convey the manner in which NGOs can exploit the various social media platforms. All the sessions were designed to elicit maximum participation from the audience and the fact that it was a fairly small number made the interactions even better. All the resource persons were not just extremely knowledgeable in their fields but could also connect with the participant’s queries and hence dialogue with them. This made all the sessions all the more helpful. Document our work regularly so that it can feed into the regular reports. The people you work for and the ways in which you can improve your work should be the ultimate driving force in any proposal. Simply put, “don’t focus on your NGO’s needs but focus on the need of the community or your target”. The proposal should reflect this. At the end we just realized that there is so much to do and we are geared up for improving on all these areas! This entry was posted in 6 - Old posts and tagged Communication, Documentation, Fund Raising, QMed's Learning Investments, Report Writing. Bookmark the permalink.